Friday August 13, 2010, was the last time I woke up in my room and made plans for the day. Happily getting ready to meet up with friends. The next time I would wake up would be 3 weeks later. In a hospital bed, only to realize the life I once lived... was over. I was born in the Soviet Union, and things were not easy for my family. I am an only child, and my parents wanted to give me as many opportunities as they could so I would have a good happy life. After looking into some things, they decided we would all move to Canada. This was a new country, and unlike Russia, would provide us with many possibilities . As the years passed, things became better for me, but not for my parents as they had trouble adapting to a country that was not theirs. So they placed all of their hopes and dreams on me. I was intent on making a good life for myself. I worked hard, and received a small scholarship to attend the University of Toronto. After graduation I had my whole life ahead of me. This however did not last long. I have never once in my life had a problem with the law. I never did anything illegal and was a good citizen. My only fault was that I completely had my guard down when a young male police officer decided to interact with me. As a direct result of this ‘interaction’ I am now physically disabled for the rest of my life and spend about 99.9% of my day in bed. The ‘Special Investigations Unit’ was assigned and quickly made it clear to me: I had no witnesses. It was my word against a Police Officer, so therefore it means nothing. I have no case. If I know what is good for me I will keep my mouth shut. I have lost track of how many lawyers I’ve tried to contact. Because I am making such a claim against a Police Officer I am avoided like wildfire. I have no case. The only thing I had left to do is to write about some of my experiences in the hopes that others can read my story and not be as naïve as I was. I paid an incredibly high price for my stupidity, and I hope that I can prevent at least one other person from making the same mistakes. I think all I can say is that I have a huge amount of respect for you as a human being. This was beautiful and sad and hopeful and depressing all wrapped into one elegantly gorgeous poem. The emotion was raw and real. These words must have so much meaning to you as a person and I really felt something special when I read them. Right now, I just have to ask you to be strong. I know you must hear that a lot, but I think it's the most support I can give you right now... You're a strong woman. Stay that way. Show the people who doubt you and put you down that you're a better person than them. You're brave for writing this and you continue to be brave by living. Please keep writing and putting your feelings into words, because this was amazing. I hope to see some more poetry from you soon and I wish you the best. Thank you so much. That really means a lot to me. I really appreciate that you took the time to read this. Kind people like you give me a reason to keep going... even though a lot of the time I find it so hard... because one day I lost so much. Thank you so much! I will do that for sure :) It means a lot to me that you stopped by and can understand where I am coming from. I feel the tormenting pain this poem is expressing. I sense the extraordinary strength of the writer. I admire the way the poem has highlighted the human heart of a "bionic" woman. Yes all of the photos are of me. A couple of months after the fall. I look at those photo now and it breaks my heart. I see a naive girl who knew in her heart that all she needed was to have the casts removed and she would go back to her life, just the way it was. 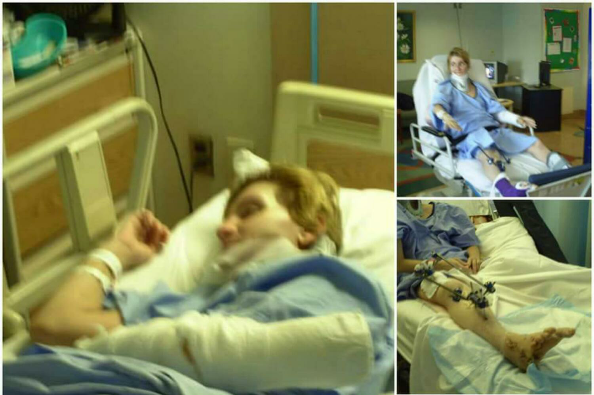 This August will be 5 years since my fall. My life had never been the same. Not even close. But hey... on the bright side my hair has now gotten pretty long and I experiment with dying it different colors all the time. But I think I like blond the best :) Thank you so much Maria for stopping by and reading more of my work. I mean that from the bottom of my heart. This is very beautiful, just like you. Keep breathing; keep writing. your struggles are not in vain. Thank you so much Jeff. My autobiography is very controversial. I have been called a liar left and right. I did not write it to become famous or rich. I just wanted people to be aware that things like this happen. For me it will be 5 years this August since I have become disabled. And amazingly enough... every year gets harder and harder. Everything I write is 100%. All I ask is for people to be kind and show me some support so I can keep going. Thank you for your kind words. Criss.. I can relate to the trauma of loosing one's life as we knew it Your words in this write hit home and I feel your frustration...Writing is the best therapy in the world,and it's free ! I am sorry for the late reply. Thank you so much for reading some of my work. I really appreciate that you can understand where I am coming from, and I would love to stay in contact. Your emotions spilled through this poem and I could detect so many emotions. I liked how your tone of voice shifted that your dream of wanting for everything to go back to normal again collided with reality. I liked how you presented yourself in this poem and showed your vulnerable side. You portrayed yourself very detailed of being numb and feeling like an outsider. I liked how you went in detail with looking at your facial expression in the mirror, and it showed yourself in a whole new different light. I saw your pictures, and I am truly sorry for what happened to you. But keep staying strong! And keep on writing pieces about this because poems reveal the real you and I think some people could relate to this. Thank you so much for such a touching comment. I apologize for the late response. I have been unwell and it's been a very rough week. Thank you again. You gave me something to smile about. WOW! Sadly, this was amazingly sad and poignant. It hurt me to read, as the pain and suffering went through is transferred with your words. You seem strong and remarkable person. Keep strong and keep trying everyday. Try to laugh when you can. I so sorry and sad this happened to you. Thank you so much for the kind words. People reading my writing and finding out what happened to me is what keeps me going in all honesty. Your comment meant a lot. This was sad and uplifting all in the same breath. Beautifully written. Thank you for sharing it with us. Thank you so much for taking the time to read it. I look forward to reading your writing. Wow! Criss you are so brave, talented and your writing is so beautiful. Stay strong, stay talented and stay beautiful. Trust me, you still have a lot of life left in you. Thank you... that means a lot to me. That was depressingly beautiful.. I could never write something with this kind of emotion. Well done, you have true talent, and I look forward to reading more of your work. You can tell this is from the heart as it really evokes emotion when reading. One of my favourite poems read on here. Thank you so much Ashley. After having read some of your writing, your comment means a lot to me and I feel honored. Thank you so much for the kind words. They mean a lot to me. And I always return the favor. I think you are an amazing writer. I love your writing style, and how you can share your feelings over a simple screen on to the writer. I would do me great honor if you could read first chapter or my Novela and give me your feedback. Thank you dear :) You are a very promising writer. Things didn't go back to the way once they were but still it can be move to the better way which you might didn't get in those days...it can be possible only by positive thoughts. Reading your poems I need to appreciate your pure and innocent heart and mind. Just put them together to make your days happier than before. I am looking forward for your future writings. You are right. I have been negative for a long time. I experience a lot of pain and do not have money for simple things like medication I need. But I need to start thinking differently. Thank you so much for taking the time to read my poem and for the wonderful comment. It means a lot. Hi Criss. Very moving Poem. I lived in the Crimea from December 7th 2007 until the end of March.The Cops in America can kill and maim with impunity, therefore I was astonished that the City Police in the Crimea were Always so courteous and helpful. My favorite Russian word is Babushka. I love the way it sounds and rolls off the tongue. Dobre Den, Kag da La, Po shals da.I fully understand why you were so naive about Canadian Cops.I greatly enjoyed the Beauty, and Hospitality of the Crimean People and the way they Honored their Veterans from WW2. The Crimea had the Finest Champagne, Fruit Wines, Vodka and Delicious beers. I Never saw so many delicious Chocolates in my Life. The Big Grocery Store in City Center Simferopol has two 24 foot aisles devoted to Magnificent Chocolates. The Breads & the Foods were fabulous. I'll keep you in my Prayers. I thank you so much for your understanding. I remember when I first came out of a coma, and began to tell the hospital staff about what happened to me they began to treat me very differently. Without my parents consent they would have a hypnotist come by and "give me a new memory." My parents were in shock when they found out about this and asked them why I would need a need memory. In return they were told that if they kept complaining and asking so many questions, their rights to visit me at the hospital would be taken away. As I write this I can't believe it myself. Months later I found out that since I woke up from a coma and started taking I was also prescribed strong anti psychotics. My parents asked many times what I was on because I was acting strange and in return were lied to. Thank you for such a kind comment. It really made my day. I have been visiting doctors this week so I am late to reply, and it warms my heart to know someone out there cares. Very moving, never stop writing. Pursue your dreams at all costs, nothing can extinguish the flame of passion. Wow... I've never read something so beautiful. The emotion of it is simply stunning. Absolutely awe inspiring. Wow this is a very moving poem. I'm respect that you still have the will to write and so well at that. Very powerful, I am happy I ready this. Thank you so much. Writing helps me. In a way it is like therapy after everything I've been through. Thank you for taking the time to read it.